What do the following events share in common? Y2K. Enron. The Great Recession of 2008. These three events over the past 15 years illustrate the evolution in the State of Trust in our corporate world today. Let’s explore how. Y2K signified the reality that business has forever become global. By 2000, the idea of a global economy no longer was abstract. We created significant interdependencies and shared interests through our efforts to ensure computers didn’t shut down the world. In spite of vastly different cultures-of-origin, the state of economics, politics, resource distribution, social responsibility, and business across nations is now inseparable. Y2K was a significant tipping point for globalization, and defined the need for trusting relations in business (in the absence of legal jurisdiction). Enron’s financial sleight-of-hand tactics initiated a de facto end of public and employee trust in the large corporation. (Arthur Andersen – a trusted accounting firm – and WorldCom, one year later, made it a certainty). Enron shook the foundation of society’s dwindling trust in companies to protect the people they serve. Post-Enron, “We trust our leaders” was replaced with “Who’s watching the cookie jar.” Enron (and other companies who dodged accountability for financial and environmental wizardry) may have been a relative outlier on the business dishonesty scale. Yet, most people now believe any for-profit business entity (and its leaders) will serve their own interests. We assume the sole focus is on realizing a profit at the expense of communities, employees, and investors. The Great Recession, among other key lessons, signified the last straw in trust of big business: The fall of the mortgage industry that nearly took down our economy. Now, employees of any company, believe there’s funny business going on somewhere. Mistrust is assumed. Trust is fragile. Skepticism of leaders derails the ability to create a transparent, open, feedback-driven culture. 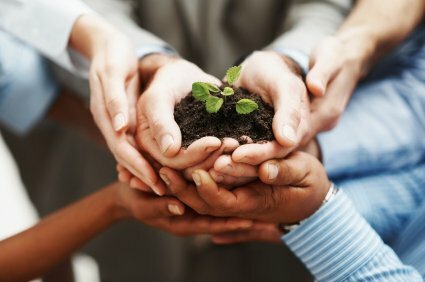 Why is Trust in Business Essential? In our work over 15 years’ helping companies build adaptive workplace cultures, we have culled out 5 Essential Habits every organization needs today – to examine and change outdated assumptions and management practices in the modern workplace (one that grows profitably). What no longer works? The “GM Nod” (say yes and do the opposite). CYA tactics. Lack of true teamwork. Hierarchical “hide and cover” tactics are like quicksand to an organization’s ability to move quickly and change. To adapt effectively in an era of technology and speed, you must focus on creating strong, effective workplace relationships between people across the business, and between hierarchies. We all know the essential ingredient in any effective relationship is Trust – not just in one’s character, but in their competency, and their communication. We covered Habit #1, Clarity and Alignment of Direction, in last week’s article. Trust is the foundation of creativity. In a high-trust environment in which people do not fear ridicule, dismissal or rejection, people open up to share ideas, think outside the box, fuel one another’s passionate engagement. In corporate settings where innovation is needed, this is a core principle. There is no shortcut to building a safe zone in teams based on high trust. Trust means something completely different in different languages. In a global economy, we are performing integrated work together across national borders. We must spend time understanding and fostering deeper trust with methods that matter to other native cultures. Trustworthiness is earned, not assumed. Today’s younger generations ask hard questions of leaders and expect answers. Even leaders with impeccable character are being asked to show greater transparency in their vision, goals, and decision making. Business is tethered directly to the speed of technology change. Amid greater complexity, no one person can hold enough knowledge for a business to compete effectively. Teams and collaboration are two essential pillars of competitive advantage. Both require interdependency, which succeeds or fails based on the level of authenticity and trust. Building relationships in which people align their communication styles and understand one another is a business process worth investing in, just as you would a software solution or project management training. This definition reminds us that trust is not only an act of confidence in someone but a responsibility on the part of the person whom others rely on. Trust is not maintained only by commitment to a strong character, but by how you manage relationship to others who are evaluating, interpreting, and depending on your actions. As fast as people are moving, the conflict-averse nature of most senior teams, as well as an over-reliance on virtual communications such as email and texting, makes it difficult to establish a culture of high trust. In business (and in life), building trust requires proactive, face-to-face communication (before trouble hits), fearless inquiry (to clarify), and constructive debate (to build buy-in). I spend quite a bit of time these days with senior leadership teams, discussing the real and important question of how to strengthen a culture of trust as the essential foundation for growth and change, in an era of uncertainty and transparency. What can people trust you for? What will it take for you to trust one another, especially when your business units are often competing for resources? How do we avoid the common state of fingerpointing and blame between alpha leaders, which erodes trust? 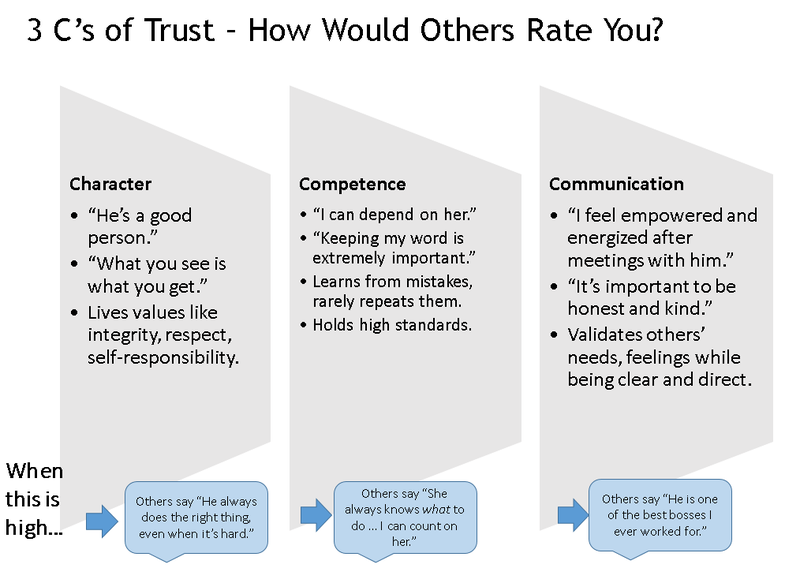 What it will take to strengthen the practice of trust within your organization? “Deciding to trust” someone always carries risk. It requires you to extend trust to someone and then behave with them in a manner that brings out their best. The majority of people will respond well to a leader who invests in the relationship in this way. Those who don’t will reveal themselves much more quickly. One of the core Culture Habits for trust-building is how to have honest conversations – creating an organizational expectation, language and process for “clearing the air” between people and in teams – early, often, and directly. It can feel very uncomfortable initially (as conflict or difference sometimes does) but the end result of practicing this across an organization is greater alignment and increased trust … and less conflict. The alternative? Continue to sweep things under the carpet, and watch chaos and fractured teamwork determine how well you keep up with the speed of change. If you want more information on how to practice Honest Conversations tool (aka HOTT Conversations), check out our Trust-Building Communication tools in our Culture Builder Toolkit.